Pátzcuaro, Mexico - Rolling up the sleeves of her immaculate white habit, Sister Ofelia Morales Francisco plunges her hands into an aquarium, grabs a large, slimy salamander and lifts it dripping into the air. 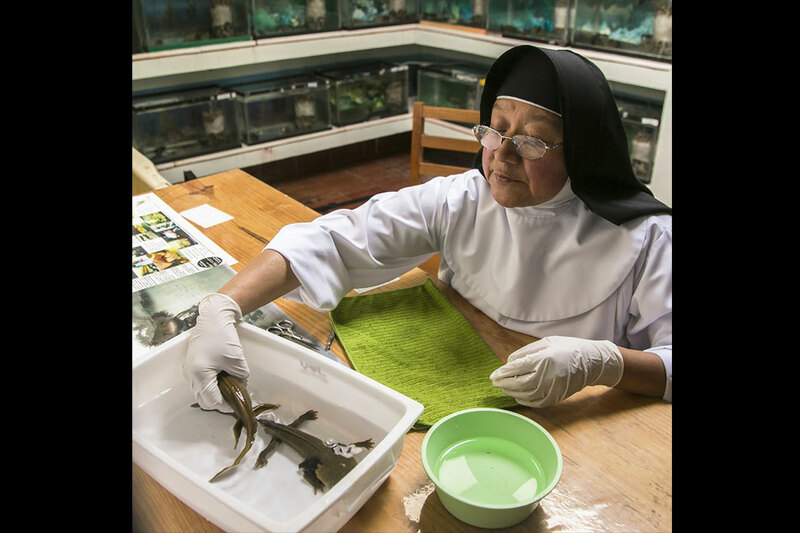 The nun is part of a team at a Dominican convent in Mexico that is fighting to save the Lake Patzcuaro salamander, a critically endangered species. Revered as a god by the indigenous Purepecha people and keenly studied by scientists, the salamander -- known for its stunning ability to regenerate its body parts -- is found in the wild in only one place: the lake near the Convent of Our Immaculate Lady of Health, in the western town of Patzcuaro. But the lake is badly polluted, and that is where Morales and her sisters come in. They have launched a program to raise the salamanders in captivity, and hope their efforts will one day help the species -- Ambystoma dumerilii -- make a comeback in the wild. It is a job that has required the nuns to step outside their routine of charity and prayer, and get their hands dirty in a field they knew little about at first. That meant, for example, mastering the reproductive habits of the dark green salamanders, which are distinguished by a flowing mane of gills around their heads. "The best way (to get them to copulate) is by mating a male with three females," says Morales, who has been working on the project for 18 years. Then comes an even trickier task. "We have to raise the offspring very carefully, because they try to eat each other," she told AFP. The nuns of Our Immaculate Lady of Health did not start out trying to save the salamanders, which are known locally as "achoques." In fact, they started out by killing them. More than a century ago, the convent began cooking the salamanders into a syrup that is reputed to cure anemia and chest infections. They likely borrowed the idea from the Purepecha, who worshiped the salamander as the twin brother of the feathered serpent god Quetzalcoatl and traditionally served it up in a soup. The nuns' syrup sold so well it became the convent's main source of income. So when the salamanders started to become scarce because of untreated sewage, invasive carp and over-exploitation of the lake, the nuns realized their convent's survival was at stake as well. They invited a priest who also happened to be a trained biologist to teach them all about the achoque. Today, they have some 300 salamanders in their care -- the maximum their two rooms of aquariums can hold. It is more than enough to keep making their syrup, which sells for 200 pesos (about $10) a bottle, and give specimens to universities for research. Occasionally, a salamander still ends up in the nuns' own cooking pot. "They make delicious soup," said Morales. The achoque is a close relation of the axolotl (Ambystoma mexicanum), another endangered salamander found only in the Xochimilco lake system in Mexico City. Both species are known for their capacity to regenerate their cells. If one loses a tail, it quickly grows another, with no scar tissue. They have the largest amount of DNA of any known species. That has made both salamanders a subject of fascination for scientists hoping to learn lessons that could apply to humans. However, since the 1980s, the achoque's numbers have plunged "dramatically," said Maria Esther Quintero, who works on protecting endangered species for Mexico's National Commission on Biodiversity. "There are very, very few achoques left in the wild," she told AFP. The International Union for Conservation of Nature warns the Lake Patzcuaro salamander "is believed to be in very serious decline, and might be close to extinction." The nuns are hoping their colony can help reverse that trend. "We are trying to rescue this species to do justice for Mother Nature," said Sister Maria del Carmen Perez, another of the three nuns who staff the aquarium. "If we did nothing, it was going to vanish." But for now, Lake Patzcuaro is too polluted to reintroduce them there. Quintero said the immediate goal of Mexican officials is to clear invasive species from at least the northern part of the lake. If that happens, perhaps the achoque can be returned to the waters where, according to Purepecha legend, it hid at the dawn of time to avoid being eaten.